In the first book of the Highland Magic series, Gifted Thief, Integrity Adair finds out about her heritage. 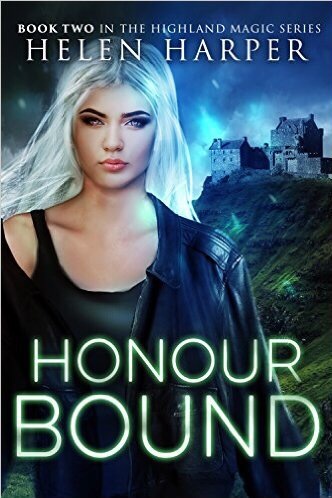 In this novel, she fights for the honor of house Adair by competing in the Sidhe Games. Integrity is always ready with her wit, still delivering one liners that pretty much only she finds funny. In these games she is at her wits end, as anything goes, and everyone is against her. She uses her brains, beauty, and a little brawn to not only try to win the competition, but to also do a little investigating into who is trying to sabotage her chances. Integrity’s attraction to Byron Moncrieff has not faded, and the two of them trade barbs and flirt dangerously. He is still almost engaged to her childhood rival, and Integrity still finds herself at the bottom of the Sidhe food chain. She doesn’t let any of that bother her, she just keeps chugging ahead. Surprisingly to Integrity, she has started to make some allies among the Sidhe, but still relies most on her band of fellow thieves. Helen Harper has done a great job of evolving Integrity’s character, so that she remains interesting. Her chemistry with Byron is still strong, but she is so much smarter than him that I’m somewhat surprised that he holds her interest. The author ends this book giving that relationship a small twist, giving the reader a cliffhanger that hopefully will be resolved in the next book, Veiled Threat, which is out 5/29/16. Buy it on Amazon, Barnes and Noble!